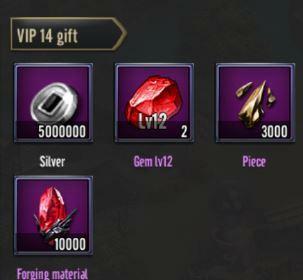 When cumulatively top-up certain amounts of Gold, you will activate corresponding VIP levels with attractive privileges. 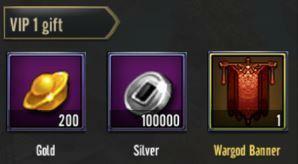 Gift pack: 200 Gold, 100,000 Silver & Gold Flag. Building team: Daily purchases rise to 2. Enhance effect: Enhance CD break equipment. National contribution: New limit 2 times/day. Hero Arena limit: 3 daily purchases for challenge in Hero Arena. Conquest: 5 daily purchases in Conquest. Military contribution: Military Hall contribute increases to 75 times/day. 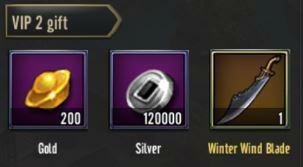 Gift pack: 200 Gold, 120,000 Silver & Winter Wind Blade. Activate diamond: Third-sub attribute required. Name right: Can change your name multiple times. Nation War War-god: Summon Wargod Team 5 times/day. Spirit challenge: Buy times increase to 8. 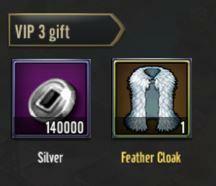 Gift pack: 140,000 Silver & Feather Cloak. Building team: Daily purchases rise to 3. Enhance equipment: Grants a chance to gain 2 levels. Quick Trade: Complete a Trade instantly. Auto-deploy: Unlock function in Nation War. Level Fund: Can purchase Level Fund. 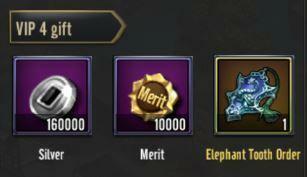 Gift pack: 160,000 Silver & 10,000 Merit & Yellow Order. Platinum Order: buy 30 Orders everyday. Conquest: 10 daily purchases in Conquest. Summon mystery beauty: unlock Pear Garden. Expedition reset: 1 daily purchase for Crusade reset. Free construct: Free construct for 10 mins. New cross-server flower limit: 8 times. Auto help: When construct can select Auto Help. Build capital: Gold contribute increases to 10 times/day. Military contribution: Military Hall contribute increases to 90 times/day. 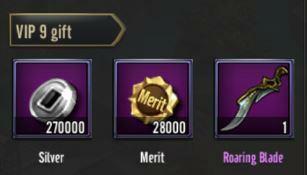 Gift pack: 180,000 Silver & 15,000 Merit & Red Blade. National contribution: New limit 4 times/day. Platinum Raid: 2 daily resets in Conquest. Hero Arena limit: 7 daily challenge purchases in Hero Arena. Nation War Wargod: Summon Wargod Team 10 times/day. Borrow Arrows: +1 buy time. Spirit challenge: Buy times increase to 10. 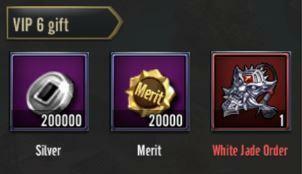 Gift pack: 200,000 Silver & 20,000 Merit & Red Order. 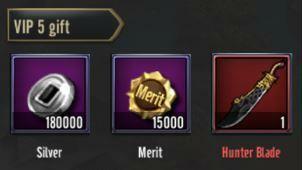 Gift pack: 230,000 Silver & 22,000 Merit & Red Cloak. National contribution: New limit 5 times/day. Hero Arena limit: 9 daily challenge purchases in Hero Arena. Conquest: 15 daily purchases in Hero Arena. Merchant: Trade increases to 3 times/day. Build capital: Gold contribute increases to 20 times/day. 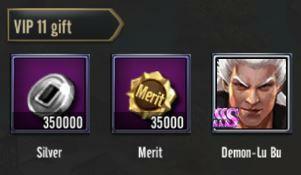 Gift pack: 250,000 Silver & 25,000 Merit & Purple weapon. Diamond order: Buy 50 orders everyday. Gold Raid: 3 daily resets in Conquest. Nation War: Summon 15 factions everyday. Free construct: Free construct for 15 mins. New cross-server give flower limit: 10 times. Military contribution: Military Hall contribute increases to 120 times/day. Spirit challenge: Buy times increase to 12. 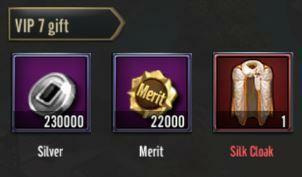 Gift pack: 270,000 Silver & 28,000 Merit & Purple weapon. Hero Arena limit: 10 daily challenge purchases in Hero Arena. Expedition reset: 2 daily reset purchases in Crusade. Build capital: Gold contribute increases to 30 times/day. 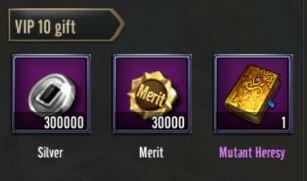 Gift pack: 300,000 Silver & 30,000 Merit & Purple weapon. Supreme Order: buy 60 orders everyday. Supreme Raid: 4 daily resets in Conquest. Conquest: 20 daily purchases in Conquest. Nation War War-god: Summon Wargod Team 30 times/day. Free construct: Free construct for 20 mins. New cross-server give flower limit: 12 times. Borrow Arrows: +2 buy times. Spirit challenge: Buy times increase to 15. 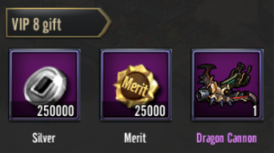 Gift pack: 350,000 Silver & 35,000 Merit & Hero Ghost- Lu Bu. National contribute: New limit 7 times/day. Build capital: Gold contribute increases to 40 times/day. Military contribute: Military Hall contribute increases to 150 times/day. 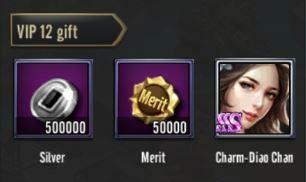 Gift pack: 500,000 Silver & 50,000 Merit & Hero Charm - Diao Chan. National War reinforcement: Summon Wargod Team 40 times/day. Free construct: Free construct for 25 mins. Spirit challenge: Buy times increase to 20. 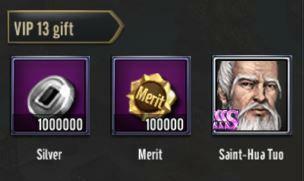 Gift pack: 1,000,000 Silver & 100,000 Merit & Hero Saint - Hua Tuo. National War reinforcement: New daily limit for summon factions - 25 times. Build capital: Gold contribute increases to 50 times/day. Gift pack: 5,000,000 Silver & 2 Gem Level 12 & 3,000 Artifact piece & 10,000 Artifact forge material. Royal Donate: Max 8 times/day. Gold Raid: Can reset Campaign 5 times. Using your VIP priority appropriately to enhance your power, my Lords!